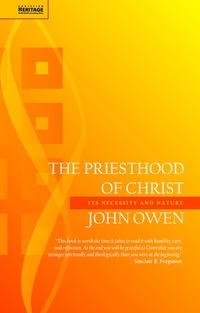 John Owen is noted for taking themes that those who had gone before had often wrestled with and write with clarity and depth. He does the same here with The Priesthood of Christ. Having studied the Book of Hebrews in great depth and written a world renowned commentary on it, John Owen is able to give us a comprehensive guide to this important theme. He explains how the Old Testament pillars of the Law and the Covenant relate to Christ’s office of Priest. Includes an introduction from Sinclair B. Ferguson.